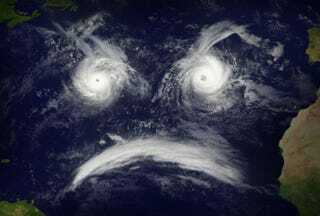 A group of marketing researchers at University of Illinois at Urbana–Champaign decided to tackle the problem of gender bias by analyzing a peculiar statistical anomaly: hurricanes with female names tend to be more deadly than ones with male names. And that was only the first thing they did wrong. Jung's team thinks that the effect he found is due to unfortunate stereotypes that link men with strength and aggression, and women with warmth and passivity. Thanks to these biases, people might take greater precautions to protect themselves from Hurricane Victor, while reacting more apathetically to Hurricane Victoria. "These kinds of implicit biases routinely affect the way actual men and women are judged in society," says Sharon Shavitt, who helped to design the study. "It appears that these gender biases can have deadly consequences." But Jeff Lazo from the National Centre for Atmospheric Research disagrees. He's a social scientist and economist who has looked into the public communication of hurricane risk, and he thinks the pattern is most likely a statistical fluke, which arose because of the ways in which the team analysed their data. They included indirect deaths in their fatality counts, which includes people who, say, are killed by fallen electrical lines in the clean-up after a storm. "How would gender name influence that sort of fatality?" he asks. He also notes that the damage a hurricane inflicts depends on things like how buildings are constructed, and other actions that we take long before a hurricane is named, or even before it forms. On top of all these basic failures to analyze statistics, this study could do lasting harm by undermining the legitimacy of studying gender bias.